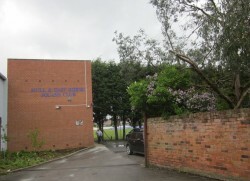 Adverse weather conditions meant a temporary change in venue for the 2013 Allam British Open as play was moved from the KC Stadium to Hull & East Riding Squash Club a couple of miles down the road. A club that title sponsor Dr. Allam has also invested in with a brand new one hundred seater showcourt opening just a few weeks ago, now centre stage for the men’s and women’s quarter final matches. 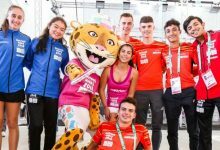 It was all go for the event organisers who managed to swap everything over in time for a midday start on a day where several sporting events fell foul of the weather including the Giro d’Italia and the Test match at Headingly. There were no other surprises in a day that followed the seedings, setting up some exciting semi-final matches at the KC stadium tomorrow. 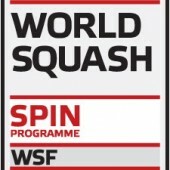 The biggest scare to the seeding’s came from Australian Cameron Pilley who looked as if he was going to record the best win of his career at 2-0 up against James Willstrop who later admitted that he was struggling to ‘concentrate mentally’ at the beginning of the match. 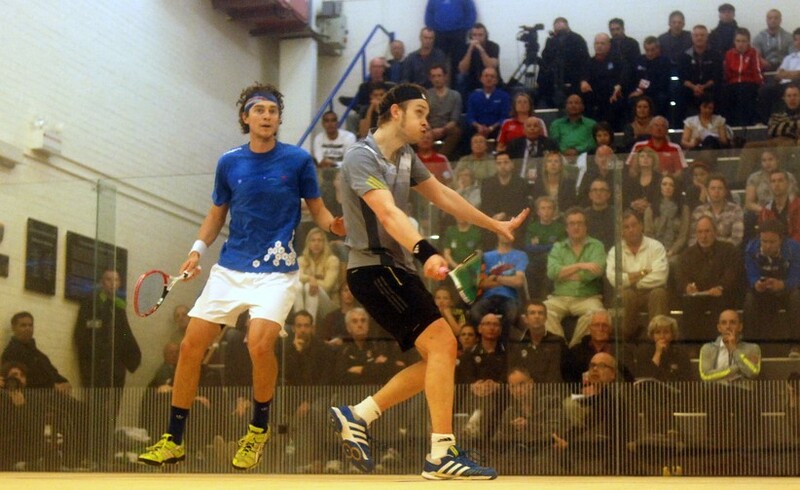 Pilley played tight, accurate squash and his trademark powerful hitting caused the former world no.1 all sorts of problems. At 12-12 the match swung in favour of Willstrop after several let balls the Yorkshireman converted game ball at 13-12 much to the delight of the vocal crowd. Willstrop suddenly woke up after some firm words from his coaching team and drew level before crushing the fatigued Pilley, who was starting to suffer from cramp 11/2 in the fifth. Struggling to catch his breath the world no.4 expressed his gratitude at the team around him for pulling him through the match. “At 2-0 down I needed calm people, so thank you to them. I wanted to win it for them. I can’t tell you how hard it was. 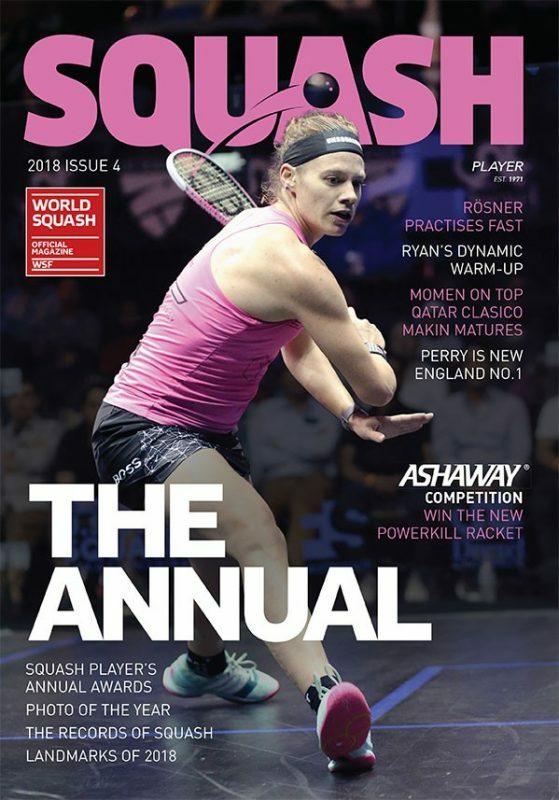 “The intensity of that squash is like brain ache I have to concentrate so hard but I’m really pleased to say I’m a semi-finalist,” added Willstrop. 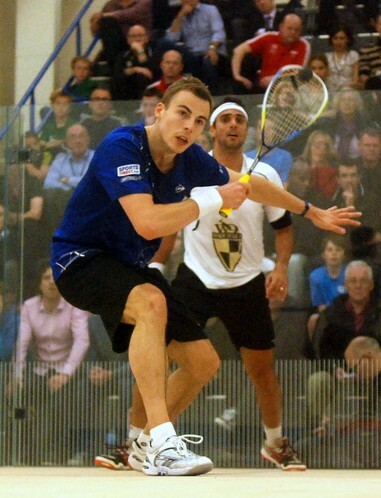 England’s Nick Matthew seems to have hit form just at the right time. The Englishman and three-time British Open champion has had a slight dip of form of late but seems to be recapturing his hunger as he steamed through his quarter final encounter. Darwish is a class act, the pair have met eleven times previously with Matthew only one win ahead of his opponent but Matthew with renewed fight and passion was relentless in his attacking. 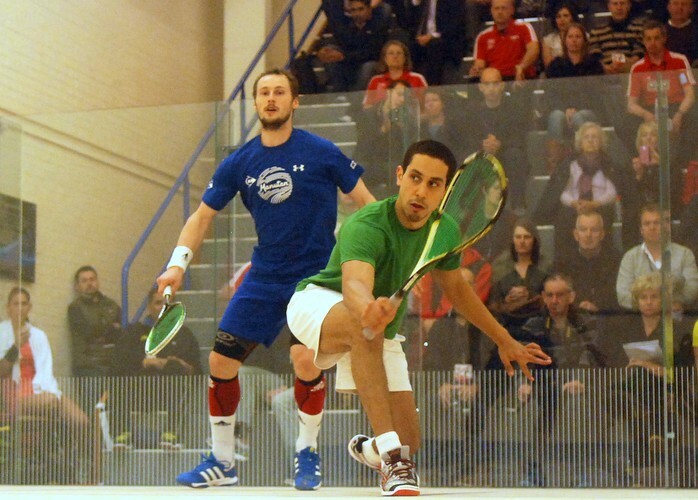 Darwish seemed under constant pressure and the Egyptian couldn’t recover losing the first 11/6. 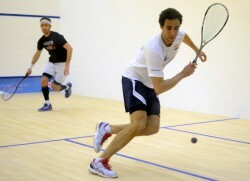 The second game was much of the same with Darwish seeming to tire from the world number two’s energy and precision. The KL Open winner mounted a comeback in the third but there was no stopping Matthew who held his nerve to take the match in three games. A pleased Matthew told the crowd he was happy the squash was able to continue despite the weather. 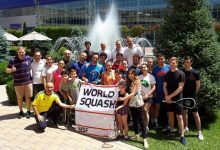 “At least, squash is able to go on! 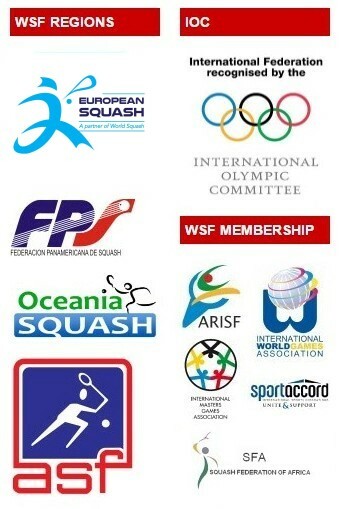 We hear today about so many sport events that have been cancelled all over the country, but at least, squash is able to go on. My heart goes to the people that bought tickets today and weren’t able to come due to the change of circumstances, but I hope we’ll be back on the glass court tomorrow. “It took a lot of effort from a lot of people to make sure that we would be able to play, thanks very much to all of them for making it happen, and you know, there is always a little hiccup or two when somebody is trying to take the sport to the next level,” explained Matthew. Matthew will be hoping to continue his form into the semi-finals tomorrow when he faces Frenchman Gregory Gaultier who came through in three against the unseeded Tarek Momen. The previous British Open champion was clearly fired up for his quarter final match coming out the more aggressive of the two taking a 1-0 lead. 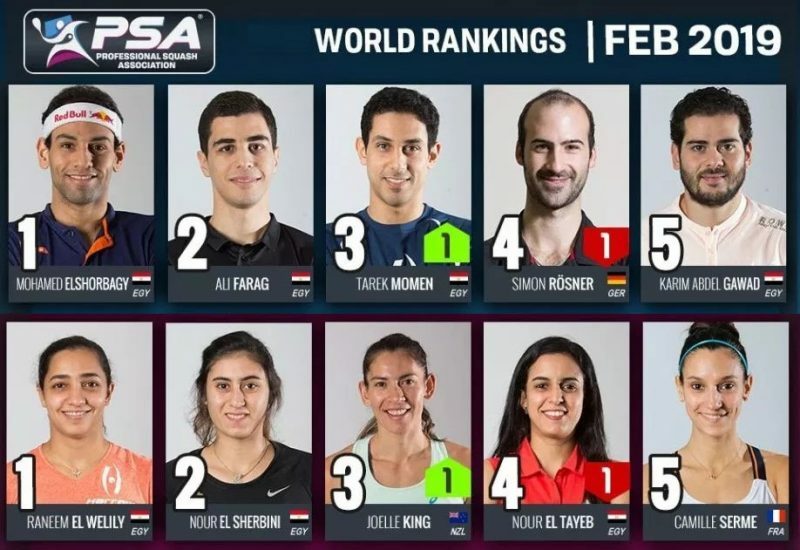 An entertaining second game saw both players taking the ball in short at every opportunity, this made for some incredible rallies with unbelievable pick-ups from two of the fastest players on the PSA World Tour. 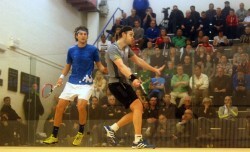 A few fist pumps and great retrievals with a combination of fast paced hitting saw Greg go 2-0 up. Despite a closer third game the fourth seed managed to keep collected and close out the match 14/12. The Frenchman said he was looking forward to returning to the glass court and a passionate crowd tomorrow. Laura Massaro continues her quest for a British Open title after overcoming the gifted Omneya Abdel Kawy. 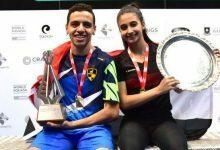 The head-to-head favours the Egyptian with nine wins to Massaro’s two with the most recent clash a surprise 3-0 win in the first round of the Hong Kong Open so the world no.2 certainly had a point to prove. Massaro took control early on never falling behind in the two first games, looking strong across the middle the Lancashire based player took her chances well. Kawy worked her way back into the third game, setting up what felt like a crucial fourth. Massaro meets another Egyptian tomorrow, the world no.3 Raneem El Weleily who saw off England’s Jenny Duncalf in another 3-1 battle. The home hopeful played well throughout the match, looking to be positive and take the ball in short but the Egyptian matched her and at crucial times edged ahead. It is doubtful that Hull & East Riding Squash Club ever expected one of the greatest squash players of all time to grace their courts in the British Open but they did in abundance today with both the world’s number one players in action, a story to tell for many years to come. 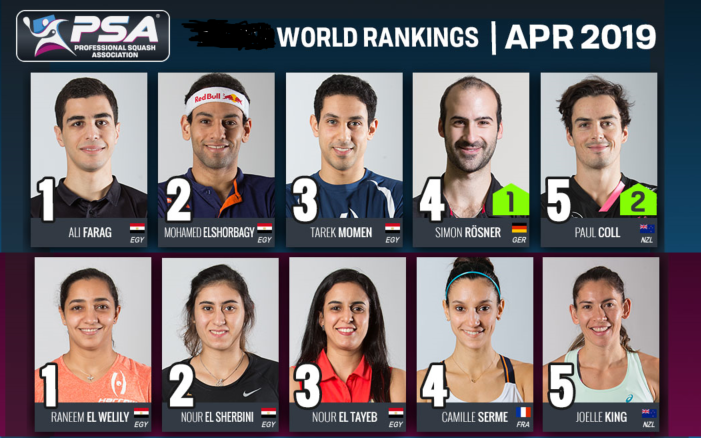 Both Nicol David and Ramy Ashour recorded convincing 3-0 wins justifying their respective positions on the top of the world rankings. 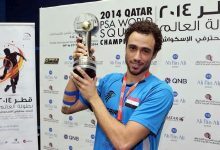 Ashour looks to be the man to beat as he eased past Spain’s Borja Golan in just over half an hour. The Egyptian was at his typical best, sublime movement mixed with extraordinary racket skills. Nicol David was up against the ever-improving Joelle King, the Kiwi started strongly finding the back corners well and looking to take the volley in short when possible, it was looking like there could be an upset in the first as the 24-year-old found herself game ball up. However, David retaliated by composing herself, taking King off the middle to sneak it 13/11. 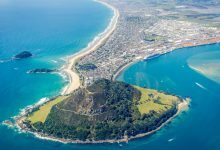 The young New Zealander played well but found it difficult as the four-time British Open champion found her rhythm easing through the second and third to win the match 3-0. “It’s great to be playing at the British Open in front of a knowledgeable crowd and I’m looking forward to my semi final tomorrow,” the Malaysian said. 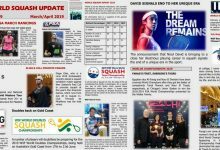 The queen of squash will have to be on her best game after England’s Alison Waters looked dominant against Australia’s Kasey Brown. The current British Champion wasted no time in despatching Brown who is now based in the USA. Waters looked to be in fantastic form taking a strong lead from the start in all three games, pushing up the court and attacking hard and low forcing errors from Brown. “I felt focused for the whole match, and that’s the best I’ve felt on court for a while,” said a delighted winner. “I’ve been a bit up and down in some recent matches, but I know that went I get on court with a feeling like that I’m a different player,” said an ecstatic Waters.